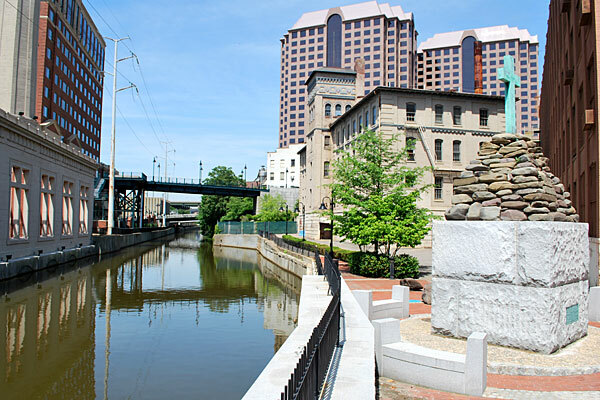 I want to paddle the canal in downtown Richmond. I love that area and want more! I’ve written about my desire to form a circuit for paddlers between the James River and the Lower Canal from Tredegar to Pumphouse Park. That one might be a tough sell to CSX and would require a lot more work for the paddlers. But a more realistic circuit would be an easy one to create that would require relatively little money and maintenance and would provide a benefit to the city. Let’s open up the Kanawha Canal from Captain Christopher Newport’s ‘Cross’ monument at 12th and Byrd Streets to Brown’s Island. The circuit would allow paddlers access to the river from the Tredegar Beach and the Manchester Dam through Pipeline — which has class III-IV rapids. The paddle up the canal would only be about a half-mile long and would allow more people to be a visible part of the downtown scene. Why have all these expensive and cool toys like the Canal Walk and the canal if we can’t use them? More time in the water is greater than more time carrying your equipment and paddlers would get behind this kind of opportunity. Some dedicated paddlers already carry their kayaks back up the catwalk over Pipeline, up the sandy trail to Brown’s Island and over to Tredegar Beach to make the run again. At the end, getting out below the Pipeline overlook and making a short walk up the hill to the canal before paddling to west end of Brown’s Island would be a huge draw to the area. Hey, if we could get a contraption similar to a ski lift to run under the famed CSX railroad viaduct, that might be a distant second-place option. Sound like fun? I’ve seen many white-water kayakers carry their equipment from the takeout at the south end of the 14th Street (Mayo) Bridge and carry it the half-mile along the Floodwall Walk to the Manchester Bridge where they could drop in and run the Southside rapids over and over. If they are that dedicated to making the run, what would they do if you let them paddle up the canal instead? 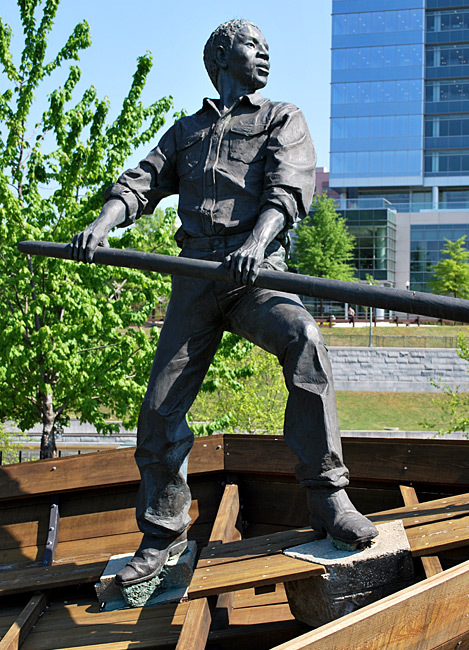 Over time, the James River’s role as the heart of Richmond’s industry and commerce has evolved. Today it is known instead for its unique recreational opportunities, such as rock-climbing and nationally recognized kayaking. Allow residents and visitors to fully enjoy this unique natural feature by creating a series of clear connections to the riverfront. Although the James River is the geographic center of Downtown, it is difficult for residents and visitors to directly reach the waterfront. 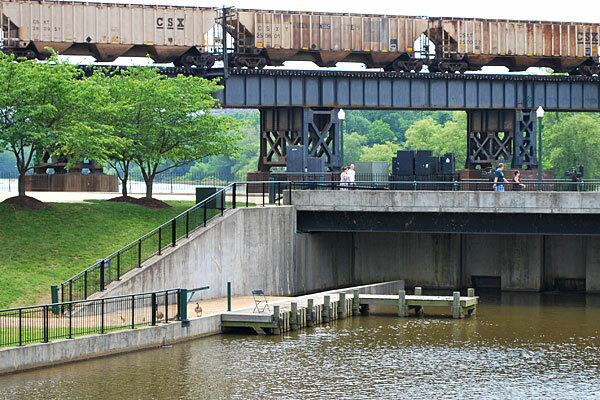 One obstacle to accessibility is the layering of infrastructure that lines the riverfront, including the canals that George Washington surveyed, the railroad lines built on top of the canal tow-paths, and the recently constructed floodwall. Richmond’s reputation for world-class kayaking and rock-climbing should continue to be promoted, and improved facilities for these sports should be provided. As for the access to the canal, there is a low-lying iron fence (see photo at right) behind the Cross monument and a small dock could be constructed there. There is already a dock at the opposite end of the canal on Brown’s Island and paddlers would be free to make the short walk over to the boat access at Tredegar Beach from there. I recently visited the beautiful new pavilion at Byrd Park and seeing all the happy paddle boaters opens up another possibility. Let’s make that same opportunity available on the Canal Walk from Brown’s Island down to the ‘Cross’ monument and use that same dock as a launch point. 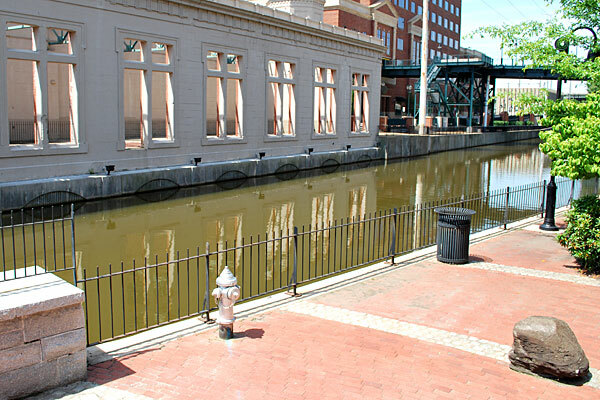 During one of the many summer festivals at Tredegar, Brown’s Island and the Canal Walk just imagine the “cool factor” the city would get seeing people using the canal. What about parking? Well, let’s play with the old Reynolds Metals property for a moment. That property will be open for development at some point soon. 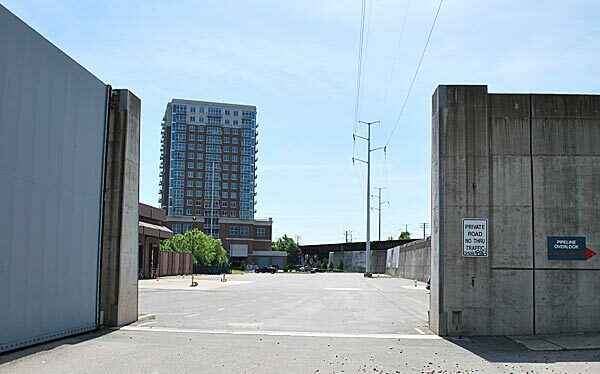 It has a large parking area that most certainly will not be available to the public if there is another Vistas on the James or Riverside on the James condominium is built. The Pipeline Rapids Walkway already has a small parking lot with about 10 parking spots available, but that lot would fill quickly. But if a forward thinker was to embrace the river and allow an outdoor shop like Riverside Outfitters or someone similar to run a business out of that area? Come on Venture Richmond, let’s make it happen. Let’s paddle the canal and give the Canal Walk another draw it desperately needs. 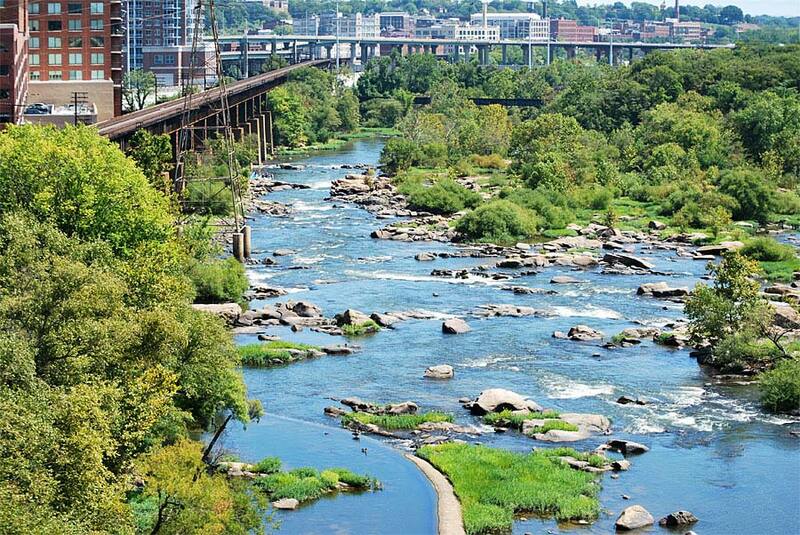 Pipeline Rapids: Downtown Richmond’s best kept secret? I think the Pipeline Rapids walkway is the downtown Richmond’s best kept secret. It’s been open to the public for almost five years, but seemingly few take advantage of it. 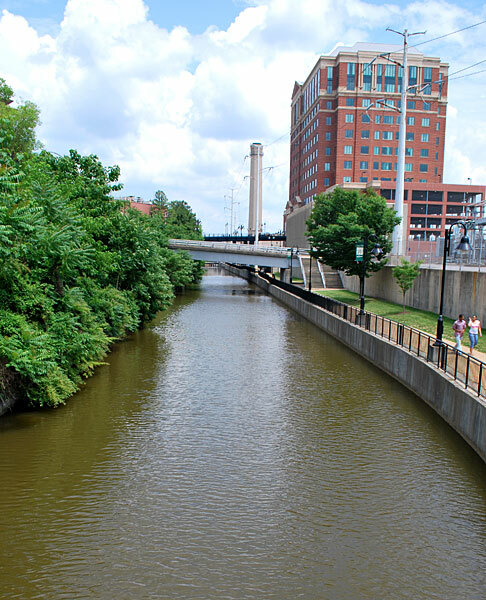 Unless you go when there is an event like Dominion Riverrock on Brown’s Island or a paddling event, it’s often just you and the raging James River in a setting mixing the wild and natural river and the urban landscape of the bustling city. I love the sound of the water as it roars through Pipeline Rapids. There’s a chance a train will add to the noise. When it’s quiet enough to hear, the birds take over your ears. 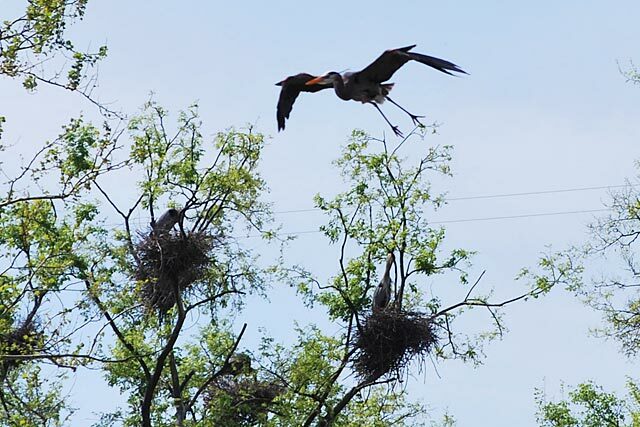 In the spring, the area has fascinating views into the world of a Great Blue Heron rookery. Environment beat writer Rex Springston of the Richmond Times-Dispatch loves this spot. I’ve seen him here on several occasions, and he has often found the most unusual migrating species here: Blue crab, fish that looked like eels, scads of fish and of course, the heron. It’s a wonderful place to watch nature and escape the city for even just a few minutes. The walkway is so named because there is a large city water pipeline running the length of the path. Both the pipeline and the metal catwalk on top of the pipeline are located directly under the busy double track CSX railway viaduct. 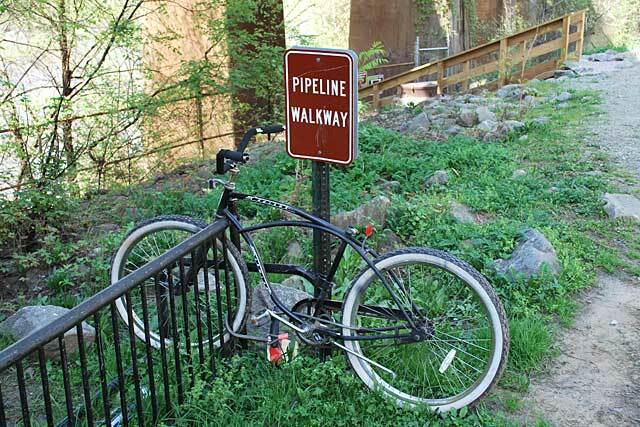 The area surrounding the Pipeline is part of the James River Park System and under its care. When water levels are up, just watching the river rage is enough — sometimes its too loud to hear the person next to you. When the river is low, giant granite boulder are exposed, giving visitors more vantage points. In full view from the pipeline walkway are Bailey’s Island and Devil’s Kitchen Island, in the center of the river. They are a worthwhile visit too, if you get the chance. A spur line of the Norfolk Southern Railroad crosses over these islands (walking on them is trespassing) past the far eastern end of the path and the 14th Street (Mayo’s) Bridge can seen under the tracks. The city is still working to improve and enhance the area. There is now a bike rack and although the ladder at the eastern end of the catwalk is still an obstacle for some, there is a new wooden staircase. TO GET THERE: Pipeline runs along the river at the Riverside on the James condominiums, is easy to access from the Canal Walk at South 12th and Byrd streets or from the east end of Brown’s Island. 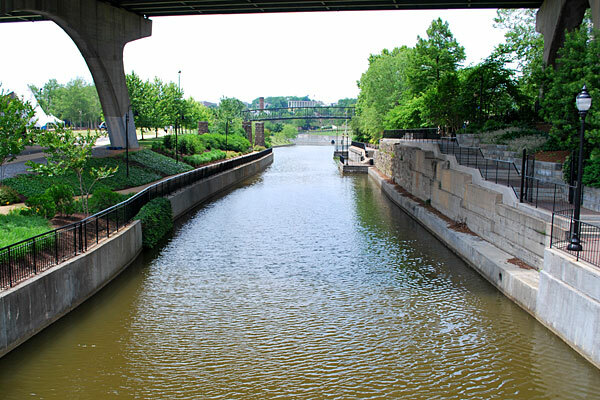 PADDLERS: The Pipeline Rapids, a hazardous eighth-of-a-mile stretch considered Class IV, are considered as treacherous to paddlers as the Hollywood Rapids at Belle Isle. There are several large boulders in the midst of the Pipeline Rapids. A friend of mine lost his father at Pipeline on a kayak trip, so please use all safety precautions. Normally the rapids in Downtown Richmond are Class II-III. Many intermediate paddlers prefer to take the Second Break Rapids, which run toward the south side of the river. 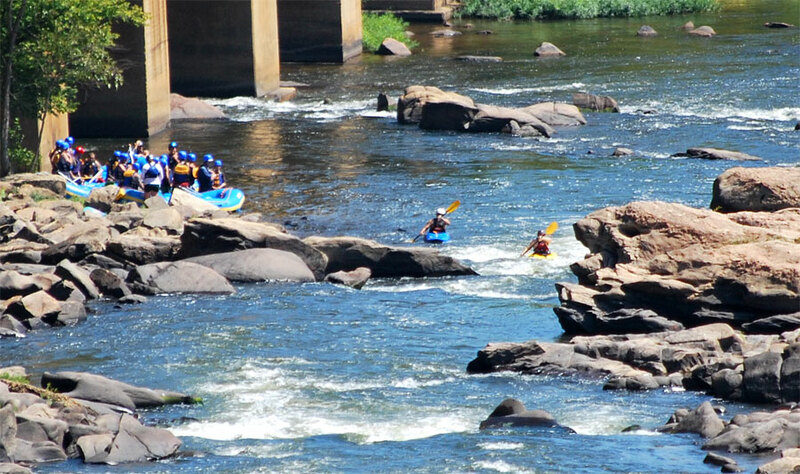 The entire area is a great (and safe) place to watch white water kayakers and rafts up close, mainly on the weekends. BIRD-WATCHING: Plenty of Osprey, blue heron, ducks and geese. The islands in the area are wild and there are multiple trees with nests in the area. 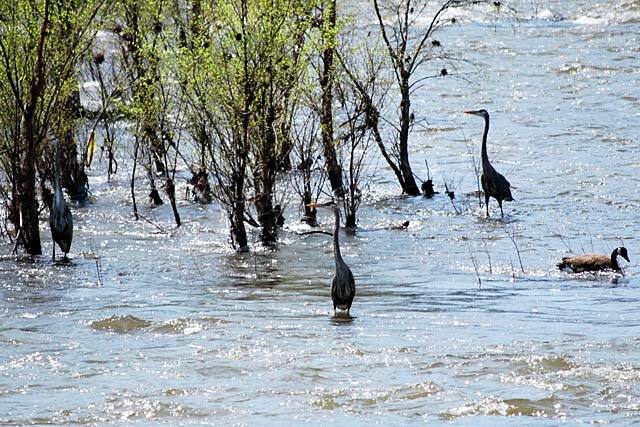 Heron like to fish in the shallow waters below the rapids and among the islands in the middle of the James, often hidden from view. FISHING: Upstream of the Mayo Bridge, where the falls begin, catch smallmouth bass, channel catfish and sunfish. In the tidal area below the falls, the catch includes large blue catfish. Rockfish and others migrate through in spring, and they like to make their runs up the more shallow banks of the river instead of the raging rapids in the middle. A license is required. HIKERS: This area makes a great loop with the Canal Walk, or an out-and-back from Brown’s Island. 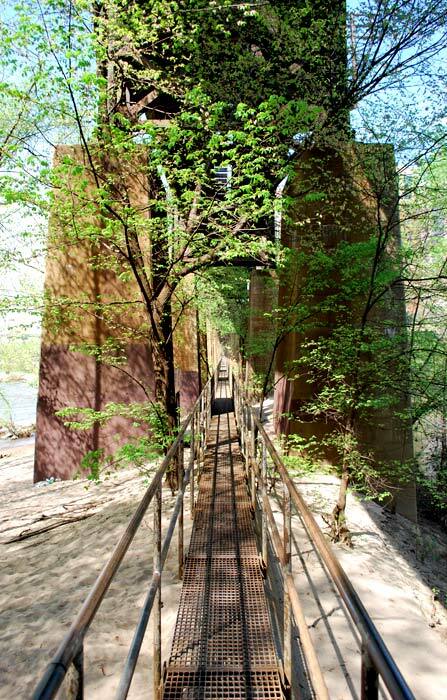 If you start at Brown’s Island, walk under the Manchester Bridge toward the river. There is a rocky trail down to the river, and follow it east along the sandy shoreline. The trail picks up under the viaduct. From the east, the pipeline walkway starts under the viaduct just west of where the train tracks cut through the doorway to the floodwall (below the Vistas on the James condos, or behind the Alcoa property). TRASH IN, TRASH OUT: I have done river cleanups in this area, and anywhere you go on the James there will be some washed up trash. The water usually moves too fast to do much cleaning. Please make sure you respect the river by not allowing anything to be thrown or dropped in. WARNING: The area is known to have a few full- and part-time “residents.” I snuck a photo of this guy napping the sun, which I admit, made me jealous. 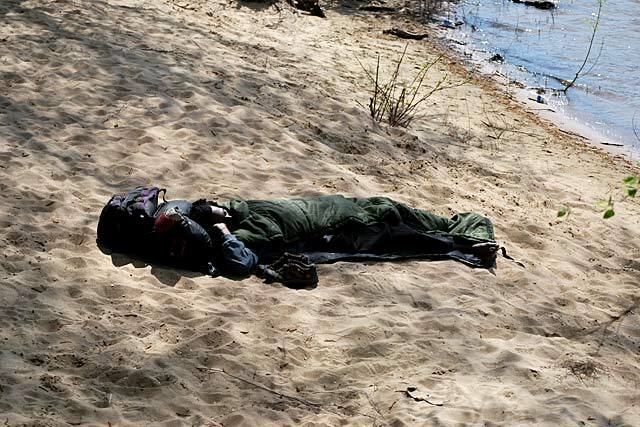 You might encounter a person’s overnight campsite or what looks like all of someone’s possessions stuffed into an old dirty bag. Those guys know to stay clear during the day, so you make sure you stay clear at night. Park closes at dusk anyway, so protect yourself.